You remember how I designed my first fabric through Spoonflower and had it test printed? Well, Spoonflower has weekly contests based around different themes and I decided to take my new fabric designing "skills" (I don't think we can call them that yet, but for the purpose of this sentence just go with it) to enter a design in an upcoming contest called: Pies. Because really, pie? Pie and I go way back. We have a close and personal relationship that always ends with me practically licking the crumbs out of the pie plate. For my birthday, forget cake, bring me a pie and I'll be yours forever. Needless to say, it was a fun theme for me. But still a challenge. It was hard to not get too "all-American, red, white, and blue up in there. 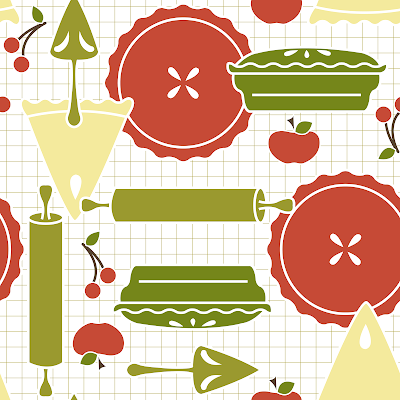 The pattern I came up with is below and you can find it on Spoonflower here. I think you can even vote for it next week if you have a Spoonflower account (I think you need one of those), and that way maybe more than just me and my mom will vote for it. That would make me feel all warm as an apple pie inside. On a side note, the previous pattern I designed is available for purchase here if you feel so inclined.